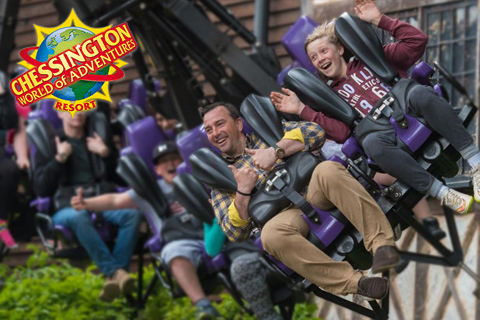 Leave the everyday behind at Chessington World of Adventures Resort. Gasp, giggle, shriek and scream as you see and do things you’ve never seen or done before. Feel your heart pound as you journey on your first wild ride, stare wide‐eyed encountering endangered animals and be spellbound as you walk through the pages of your favourite book on an enchanting new adventure in 2019. See if the Witch with a long ginger plait has room on her broom for you and your family, in brand new Room on the Broom ‐ A Magical Journey. Help the Witch and her Cat find her lost belongings, but watch out for a fearsome foe, Dragon, who fancies ‘Witch and chips’ for his tea! Legal - © 1991 & 2001 & TM Julia Donaldson & Axel Scheffler. Licensed by Magic Light Pictures Ltd. © Orange Eyes Ltd. 2012.